The Ellett Line is a hydrographic transect consisting of 35 individual fixed stations which were occupied, usually at least once a year, between 1975 and 1996. The time series is named after the scientist David Ellett, who coordinated the survey work at Dunstaffnage Marine Laboratory (DML), near Oban. The transect ran between the north west coast of Scotland to the small outcrop of Rockall, via the Anton Dohrn Seamount - a prominent bathymetric feature in the Rockall Trough (see map). STD/CTD dips and associated water sampling for the analysis of nutrients were routinely performed during each station occupation. In 1996 the transect was lengthened to incorporate new additional fixed stations crossing the Iceland Basin from Rockall to Iceland. 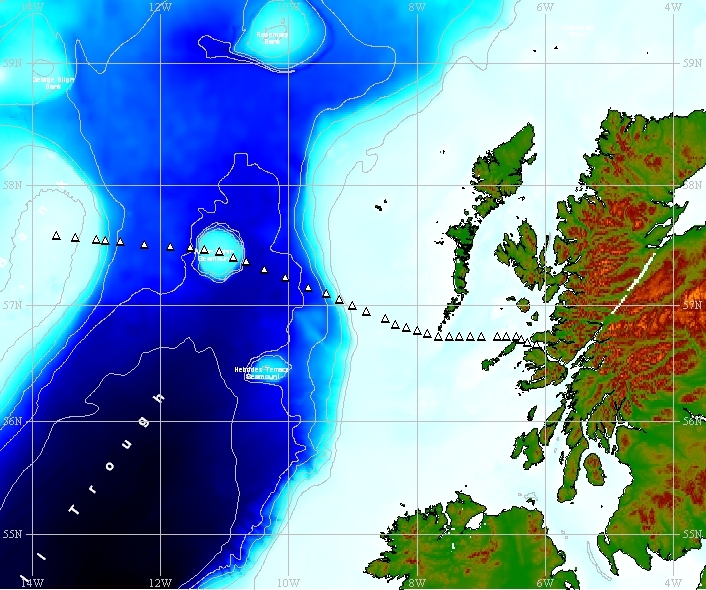 This transect, which is still routinely occupied annually, is now known as the Extended Ellett Line and is a collaborative effort between scientists at Dunstaffnage Marine Laboratory and the Southampton site of the National Oceanography Centre (NOC). The white triangles indicate the nominal positions of the Ellett Line stations (1975- 1996). Measurements made along the Ellett Line lie within a box bounded by co-ordinates 56° 40.02' N, 13° 42.0' W at the south west corner and 57° 37.2' N, 6° 7.98' W at the north east corner. Listed below are nominal details of the standard hydrographic stations that formed the Ellett Line between 1975 and January 1996.